This LASCO C2 image shows a very large coronal mass ejection(CME) blasting off into space on 2 December 2002. 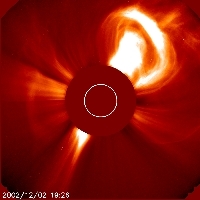 It presents the classic shape of a CME: a large bulbous front with a second,more compact, inner core of hot plasma. This material erupts away from the Sun at speeds of one to two millionsmiles (or km) per hour.